Functions of a Complex Variable and Some of Their Applications, Volume 1, discusses the fundamental ideas of the theory of functions of a complex variable. The book is the result of a complete rewriting and revision of a translation of the second (1957) Russian edition. Numerous changes and additions have been made, both in the text and in the solutions of the Exercises. The book begins with a review of arithmetical operations with complex numbers. 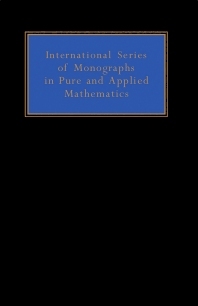 Separate chapters discuss the fundamentals of complex analysis; the concept of conformal transformations; the most important of the elementary functions; and the complex potential for a plane vector field and the application of the simplest methods of function theory to the analysis of such a field. Subsequent chapters cover the fundamental apparatus of the theory of regular functions, i.e. basic integral theorems and expansions in series; the general concept of an analytic function; applications of the theory of residues; and polygonal domain mapping. This book is intended for undergraduate and postgraduate students of higher technical institutes and for engineers wishing to increase their knowledge of theory.